The DC Comics New 52 Firestorm has already proven as volatile in the real world as it is on the comics page. Writer Gail Simone and co-plotter Ethan Van Sciver team with artist Yildiray Cinar for The Fury of Firestorm, the Nuclear Man: God Particle, though Simone leaves after this volume to be replaced by Joe Harris, and then the whole team leaves after the second volume to be replaced by Dan Jurgens. In this way, it's hard to get too attached to what Simone and Van Sciver present here, though it's certainly an ambitious relaunch of the Firestorm mythos. At its best, Firestorm offers some interesting political intrigue and two affecting, realistic protagonists; the plot, unfortunately, stalls at times, and Cinar's good art is not always well-served here. The first best thing about Simone and Van Sciver's Firestorm is the believable interactions between heroes Jason Rusch, who's black, and Ronnie Raymond, who's white. From the outset, the writers make this the boys' chief difference, even more so than that Jason is a "brain" and Ronnie is a "jock." Jason chides Ronnie for the lack of key black football players on their high school team, Ronnie acts as though he doesn't "see" race, and later, Jason regrets his misplaced anger while Ronnie wonders at his family's own unspoken biases. The boys inevitably become grudging allies, but the writers preserve their young outspokenness and naïve idealism throughout. When the two pray together over a tragedy at the end, it demonstrates a perfect understanding of these characters as different from Superman or Batman, or even the Teen Titans. The second best thing about Firestorm is the idea that, in this relaunched continuity, Professor Martin Stein created "Firestorm protocols," one for each country, that would bring about world peace through mutually-assured destruction. Filtering this real-world issue through a superhero lens is brilliant itself, but the writers also demonstrate its considerable story utility -- not just that "official" Firestorms fight one another, but that Firestorms go rogue and that Firestorm technology is stolen or cobbled together to create monstrocities. "Our" Firestorm's fight with the American Firestorm Helix, or the Russian Firestorm Pozhar battle with a renegade Middle Eastern Firestorm, are both great new uses for this long-time character. God Particle, however, is largely bogged-down in fantastical superhero tropes, when a stronger "real world" direction might have served the title better. Like every other DC New 52 title, Firestorm has its own rogue military-science group, Zithertech, and the Firestorms' first foes are the bland assassins the Hyenas. "Secret organizations" like SHADE and Checkmate work in Frankenstein and OMAC because the absurdness of these groups match the absurdness of the characters; even Teen Titans has a certain flashiness that sells a organization actually called NOWHERE. But against Firestorm's science and politics, Zithertech seems one-note, an uninspiring challenge for these interesting heroes. This extends to Firestorm's fifth chapter, in which Jason and Ronnie begin working for Zithertech. Ronnie believes Zithertech's false altruism completely, while Jason still has doubts, but yet both go to diffuse a rogue Firestorm holding a whole concert arena hostage, believing it to be a test and a publicity stunt. The reader already knows the boys are in danger, and it stretches all credibility that Jason and Ronnie can't figure it out, too. The ensuing tragedy is gripping, to be sure, but the latter issues feel like the writers specifically moving the Firestorms to a certain place without the sufficient logic to get them there. Also as with many other DC New 52 titles, artist Yildiray Cinar has a stellar first issue, but the quality of the art comes and goes from there. Cinar, who drew a couple fantastic collections of Legion of Super-Heroes, uses a lighter-inked style here that looks at times like colored pencils, and emphasizes especially the flames and wide stretches of color in the Firestorms uniforms. The inks get heavier in the second chapter, however, with "Kirby dots" in some of the flames almost blacking out their light; long-time inker Norm Rapmund doesn't hurt Cinar's pencils in the end, but the art loses the earlier ethereal quality and simply looks like an "average" comic. Hearkening back to the realism this Firestorm seems to need, perhaps Van Sciver's stark angles might have been more appropriate for this title than Cinar's round lines, more suited to the space-age Legion. Firestorm is an interesting choice for the DC New 52; this is a character who's struggled to hold a title of late, but in truth Firestorm ought be one of DC's "iconic" staples, given his inclusion in the Super Friends cartoon and the Justice League. With this title's rotating creative teams, it would appear Firestorm is still struggling, and probably what's needed is this character's inclusion in the new Justice League or Justice League of America. That Dan Jurgens will ultimately take over this title suggests such a move, given Jurgens's own work on superhero-y titles like Superman, Justice League, and Booster Gold. A more superhero-y take on Firestorm, however, would unfortunately seem incompatible with the title's current "world politics" aesthetic, and it remains to be seen just what Firestorm turns in to. With all of this, again, it's tough for the audience to hang their hat on what they read here. 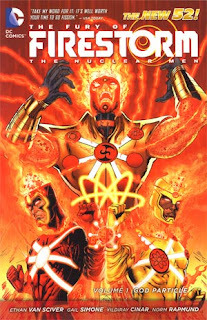 The Fury of Firestorm, the Nuclear Man: God Particle makes a good case for the New 52 character, if it does not necessarily use the Firestorms spectacularly; hopefully some creator can build on that toward a viable series. Later in the week, our review of the New 52 Green Lantern: New Guardians Vol. 1. Fan the flame! I've never seen a comic miss the point as much as Fury of Firestorm. The entire point is having two bickering minds in a powerful body. Having two separate Firestorms is just silly, especially if them merging is presented as a bad thing. It's a shame, because the creators involved are all so good. I especially liked seeing Joe Harris return; I loved his work on The Ray. I just wish they would collect the Infinite Crisis-era Stuart Moore material. The issues right before One Year Later were brilliant in how they dissected Firestorm's power set. My thoughts exactly, Doug. Firestorm represents the classic idea of team work by dropping all differences aside for the greater good. In this case, two opposites come together to make a powerful nuclear being known as Firestorm. But having each as a powerful being...whats the point? Other then that, I also missed the sense of fun. Older Firestorm comics had fun and excitement. This book feels to melodramatic (for my taste). But is it a bad book? Not really. It does do a different take on said character--which is admirable considering the New 52 is about trying out new things--, but I feel it's lacking in its scope and direction. Though I do feel J.T. Kruls Captain Atom does a far better job at using his power set from the characters world perception. Whenever that gets reviewed. Can't wait for the review of Green Lantern: New Guardians this week. 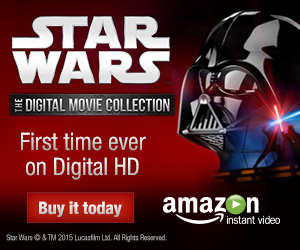 I already did my review for it on Amazon, so it should be interesting to see what you have to say about, CE. I love Firestorm he is one of my fave DC characters, Gail Simone is one of DC's best writers & Ethan Van Sciver is an amazing artist. But this book is a mess. The original concept of Firestorm is two very different people being forcibly merged into this super-powered hero who is far more then the sum of his parts. Making non only multiple American Firestorms but international ones is really cheapening the original concept. And the longer the story ran the worse it got. DC obviously realized the problem considering the whole original creative team is gone by the zero issue & they have a single merged Firestorm as the only one left. I agree that this run was a huge misfire. Following up on the cliffhanger from Brightest Day would have been a lot more interesting than using multiple Firestorms as an ill-conceived metaphor for nuclear weapons. They should have retooled this book as soon as Simone left, but instead they had Harris and Van Sciver keep this status quo for another seven miserable issues. @doug,glassman, you seem to have mistaken Joe Harris (who used to write Slingers and Bishop: The Last X-Man for Marvel) for Jack C. Harris. And I agree that Stuart Moore wrote the best Firestorm run in recent memory, making up for the terrible job Dan Jolley did on the first 13 issues. I hadn't considered how this Firestorm concept deviates from the key of the original Firestorm (two people in one body), and that's an excellent point. It seems Dan Jurgens is now returning to the core of the character (just one Firestorm), but much as I love Jurgens's work, it doesn't make me think "international politics" (but rather, "caped superheroes"). Hopefully Jurgens can give us the best of both. AngryLionheart, a Captain Atom review coming up in the new year. My copy's staring at me, actually. I was not there for whatever it was that happened at Marvel. What don't some readers like about Bob Harras? He was an overbearing EiC who micro-managed titles to the point that many good writers like Mark Waid, Steven Seagle and Joe Kelly left Marvel because they couldn't stand having to rewrite their stories at the last minute in order to address a new ideia editorial just came up with. In other cases, he would simply get an assistant editor to rewrite their scripts, like what happened with Waid's Captain America #14. He was also responsible for making the X-Men books completely impenetrable for new readers due to excessive crossovers and plot points that would start in a book and end in another, which meant you had to keep up with almost a dozen X-titles if you didn't want to miss anything important. Another thing I wonder about Harras is how much influence he's had in hiring creators. Jim Lee tends to get the bulk of the blame for bringing back the '90's retreads (Lodbell, Brett Booth, Ann Nocenti, Marz, etc. ), but as mentioned, Harras was the EiC of Marvel when all of them were there. Maybe he has a good relationship with them and it was actually his call and not Jim Lee's to bring them back. But all of this is just speculation until the insider story is published somewhere.